Passionate. Committed. Excellent In Every Way. Healthy Connections Developmental Disabilities Services is committed to providing quality care in our community. Our clients can expect to experience comfort and relaxation while our team of care providers will take care of their needs. We are a privately owned and operated home care service provider, proudly serving the residents of Columbus, Ohio and neighboring areas. Caring for your health is something we take seriously. This is why our agency meticulously and carefully selects the individuals who will join our team. Before hiring them, our applicants were subjected to a series of pre-employment process that includes a background check, evaluation of their skills, medical tests, and reference checks. Healthy Connections Developmental Disabilities Services has your loved ones best interest in mind. We strive to provide the best and most dependable delivery of adult daycare and home care services. Our experienced and skilled staff will be deliver a quality of care that exceeds expectations. To provide a safe and well-supervised environment designed to meet the needs of children and adults with developmental disabilities. Healthy Connections Developmental Disabilities Services does not discriminate against any person on the basis of race, color, national origin, disability or age in admission, treatment, or participation in its programs, services and activities, or its employment. 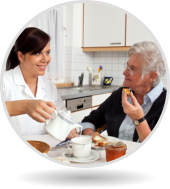 We provide quality home care services to anyone who needs it.